You can easily create DNS records for your domain by using the Cloud Control Panel. 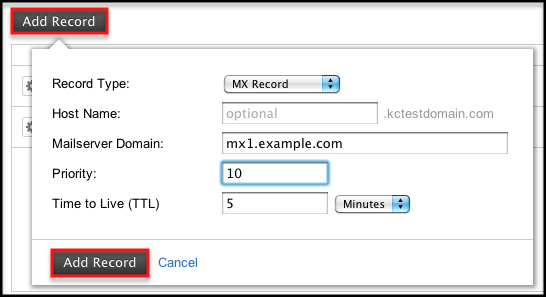 This article shows you how to create a Domain Name Service (DNS) zone for your domain and add basic A, MX, and CNAME records by using the Cloud Control Panel. The article also demonstrates how to delete records and domains. Log in to the Cloud Control Panel. In the top navigation bar, click Select a Product > Rackspace Cloud. Select Networking > Cloud DNS. Note: Time to live indicates how long a DNS record is cached before it’s updated. When you’re finished entering information, click Create Domain. Your domain appears in the Domain section, along with options to create other DNS records. When you’re finished entering information, click Add Record. Experience what Rackspace has to offer.